Editor's note: This story has been updated to include details on the State Republican Executive Committee's passage of a resolution promoting "religious liberty for all Americans." 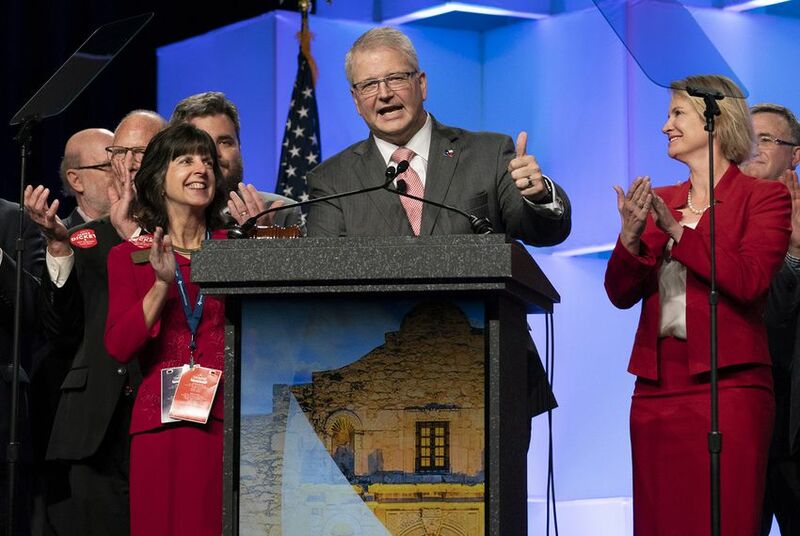 As they gear up for a challenging 2020 election cycle, Texas Republicans have decided to start paying their state party chairman for the first known time. Late Friday, the State Republican Executive Committee approved a 2019 budget that includes a $150,000 salary for the chairman, James Dickey. The budget passed on a voice vote that drew audible opposition but not enough to defeat it. The decision comes weeks after a rough midterm election for the Texas GOP, which saw a closer-than-expected U.S. Senate race and the loss of two U.S. House seats, two state Senate seats and 12 state House seats. A presidential election year in 2020 appears no less daunting for Texas Republicans, and supporters of the salary — as well as a significantly bigger budget — argued the party needed to make serious changes to get ready for the next cycle. The salary issue generated heated debate after it was first proposed by party leadership, including Dickey, earlier this year. Party chairman has long been a volunteer, two-year position, and opponents of the salary questioned whether suddenly changing course was the best use of the party's resources, especially after Dickey ran for the office on the basis he would be a non-paid volunteer like his predecessors were. Dickey sought to allay such concerns at a committee meeting earlier Friday, when he announced that a longtime party donor, Kathaleen Wall, would cover the salary through the 2020 convention. He made clear, however, that the donation by Wall, also an SREC member, was "conditional on us being all in for doing substantial changes for 2020." The budget that was approved late Friday reflects that ambition, coming in at over $5 million — more than double the usual size. Dickey has expressed optimism that, given the stakes of the 2020 election in Texas, the party would be able to raise more money nationally, among other things. The salary, however, remained arguably the biggest point of contention as SREC members headed to Austin this weekend for their fourth-quarter meeting. Those uneasy with the proposal scored a small victory Saturday by pushing through the creation of a panel that will "conduct quarterly performance reviews" of the chairman as he collects a paycheck. Dickey has served as chairman since June 2017, when he took over after Tom Mechler stepped down. Dickey won re-election earlier this year after a contentious floor fight at the party's convention in San Antonio. The chairman's salary was not the only notable business that the SREC took up this weekend. On Saturday, it unanimously passed a resolution reminding GOP groups to protect "religious liberty for all Americans" — a move spurred by a recent push to oust the Muslim vice chair of the Tarrant County party, Shahid Shafi. The final resolution was much less specific than the initial one, which defended Shafi by name and was directed at the Tarrant County party. Nonetheless, Shafi, who attended the SREC meeting, praised members for taking action as he spoke after they approved the resolution. "There were moments of doubt in my mind, but today you have removed doubts as to who we are and what we believe in," Shafi told SREC members. "I'm hopeful for our country and I'm hopeful for our party."